Does it ever seem like to you that you are catching up in age with those older than you and they are not getting older, just you are? I have been feeling like that lately, like suddenly those who were way older are not so much older anymore. Getting more mature and older seems to do that to a person, I guess! I have wonderful friends who are my moms age, in fact my closest friends are moms age and my mom, so I guess that may be why. I relate more to people those ages than the ones more my age. It could be too in the way I grew up too. My mom was not too old when she had me, so maybe that helped us to be closer, I am not sure. <p> I have caught myself though looking at young people getting married and thinking ‘They are so young to be getting married, having babies…." "Do they know what they are getting in for?" I catch myself though because it is easy to say that now, but people said it when I got married too! It helps me remember why I do this day to day sometimes seemingly useless jobs of cooking, cleaning, taking care of clothes and other things as you remember where you started. It is when it started with the tiny baby who was so helpless, depending on you for everything and you were so in love, but that is the same one that can really drive you crazy at times now that they are toddlers!! The same ones who are gobbling up food like they are starving, and yet the same ones who kiss you good night and tell you how much they love you. We work hard to bring them into this world and it is with joy we accept them, then as we raise them we have the hard labor again of teaching them what is right and wrong, how not to scream for things, to be polite and to just try to be presentable!!!! We want to pass on a love for God, we want to teach them all sorts of things and yet inside we wonder how on earth we are going to do it as we still feel like a little child ourselves! <p> So, as we all get older, just remember probably we all feel young inside, time passes quicker than you think and take each day as it comes. Rejoice that we have today, for you never know when God will call us home. Wednesday: I was not home- spent all day at the hospital with a friend. Beautiful baby girl! Tuesday: Dentist appt- gone, back Wed.
My family was not huge into beans, other than refried beans and chili some, but I really loved black beans when I was introduced to them! We made a good friend who had grown up in Cuba and she made black beans and rice that I really liked! They are really flavorful and even my boys like them! Add 1 t. cumin. In a frying pan saute a chopped clove of garlic in a little oil, until brown. Add to beans. Just before serving add 1 T sugar and 1 T. white vinegar. Serve over rice. Afterwards I like to make Black bean Chili from the leftovers. 1 c. salsa mild or med. Combine all ingredients in crock pot, except cheese, chips and sour cream. Cook on low 8 hours. Just before serving remove chicken and slice into bite size pieces. To serve put a handful of chips in the bottom of the bowl and ladle chili over top. Top with cheese and sour cream. You can use more or less chicken if you want! If you like it spicier use spicy tomato sauce instead of regular. To save money, I also buy #10 cans of diced tomatoes and tomato sauce and freeze it. You can put them in the crockpot all frozen if you want. Forty-five years of communistic control had left Romania in dire straits. Poverty Hunger and despair fueled a vicious cycle of sickness, death, alcoholism, broken homes and broken lives. I grew up reading Christian Aid Ministries newsletters, back before it was Christian Aid Ministries and when it was Christian Aid for Romania. We sent clothes, we supported a family with food packages and wrote to them. I even had Silvia’s niece for a penpal for awhile. So, this story of the orphanage really tugged at my heart. I think the thing I found the most amazing was that most of the children were not at all orphans, but usually had at least one parent alive. In one chapter, it tells of a visit to a village and a mother dressed her children up nice hoping to convince them to take them to the orphanage. It just really made me want to cry! Johnny Miller relates how he sort of felt like the woman in the shoe as suddenly he was in charge of 53 children! He shares a story of hatching eggs into chicks and he planned on butchering all the ones he hatched and saving the others, when the children realized that all the "Romanian chickens" were going to die and the "American chickens" were going to live, they protested that it just was not fair and in the end all the chickens died for fried chicken dinners! From trading ice cream for fast treatment at the emergency room, to dealing with punishments for riding in the dryer and dealing with relatives with bad motives were just a few things Johnny and Ruth Miller experienced. <p> This well written book is a very good read, one that would be a great read aloud! You can order it from <p> Christian Aid Ministries P.O Box 360 Berlin, OH. 44610 <p> Ask about their other books as well and sign up for their newsletter. There is also a link to buy the books there! Yesterday after a pretty much sleepless night, I spent Sunday morning in the nursery, which is okay as it is only every three months, but it feels like I skipped church. So, I came home and since I was short on time made chicken quesadillas instead of chicken noodle soup. We ate that and then went off to church with F. It was nice, the boys did fairly well in church and it was only 2 hours this time, so it seemed short. There was a nice cross breeze in there which kept it nice and cool, but I found some small entertainment with one lady being hot (I think she was expecting and having a discussion with a man who had shut some windows because they were worried about the drafty wind…..) We only had to go out once to get T. to sit still so that was good and it was nice to have some prayer time. <p> Afterwards we were invited to a couple’s house we have been wanting to get together with for awhile, so even though I had something I was thinking about going to at 6 (and it was 4 pm.) we went. It was alot of fun except I am not sure I was good for conversation as I was so tired! She made a wonderful dinner with sausage and hot dogs wrapped with bacon, steak, chicken nuggets, a lovely cabbage salad which is finely shredded cabbage, dill, and thin sliced cucumbers with salt, a different cold soup than I have ever had, but it was good, mashed potatoes, fresh bread, and then she had desserts and tea. It actually got a little chilly out there, but then they started a fire to help with mosquitoes and that helped warm us up too! <p> I stopped by the place I was going to go and said goodbye and it worked out well. It was fun and I hope we can do it again sometime. I am trying to work up my nerve to invite people over and come up with all kinds of excuses not to, the main one being "Does anyone want to come over?" Second one being "My table is small’ and it goes on from there. "My house is not clean enough", "What would we talk about?" "What if they do not like my food?" ……I said, excuses! <p> Speaking of messy houses, I need to go get busy on my chores and get boys busy too! I took a nice walk this morning, it was very peaceful!! I have sort of been lazy a bit the last couple day and it has put me behind in daily activities! We had alot to do today, but it was a fun day. I am tired though….. I watered my tiny garden this morning to start after starting a load of laundry. 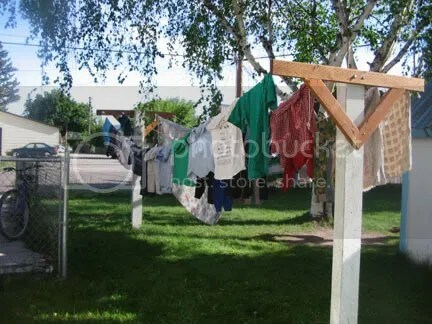 It was a nice day so I figured i would hang the clothes out to dry. I am hoping that saves some on electricity!! We needed a ladder. We had one that had something sad happen to it, so we went on a search for a ladder. I had circled several garage sales that said they had tools, hoping there might be a ladder for a decent price. It was fun! This one sale we went to, was a Estate sale. The house was beautiful, it was an old home that had been kept up very nicely and had so much character. They had all this old furniture, neat stuff for sale there and it was so much fun to just look! There was an old wood cookstove that was in mint condition, the neatest storage cellar down there in the basement and just so organized. I loved the house. 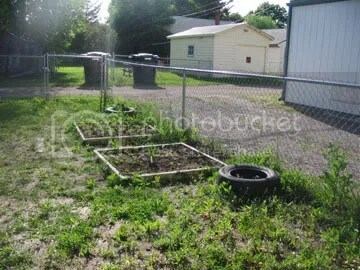 It is right in a very busy part of town, but had 4 acres with the house which it is in an odd place for that. I just hope the person who bought sells the house to be moved if they just wanted the land. Anyhow, back the story, they had a ladder!! For $10 a sturdy wood one! We also bought two shovels for $2 each that we needed for snow in the winter (I paid $8 for a plastic one last winter! ), a box of jar rings and they gave me a bunch of jelly jars. Some of the lids look like antiques so I am not sure if they will work, but there was some newer ones in there too. It was worth $3! 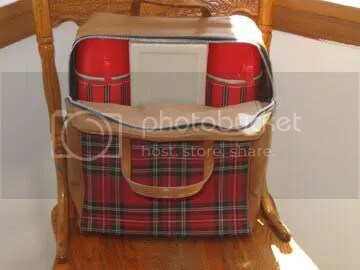 I also got this lovely picnic set, I have always admired them in old cookbooks! it has two large thermoses and a container for sandwiches! It was in in excellent condition for $3 also! 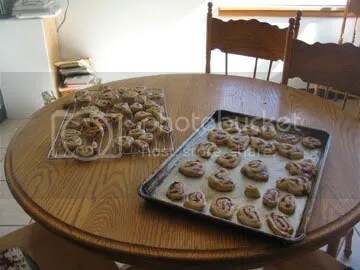 I cam home then and had to get busy baking! We have a baby shower the church is giving and I had baking to do for that. Yay! 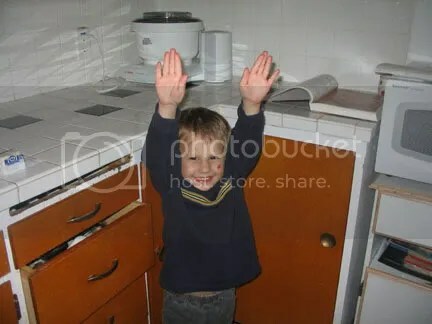 Mom is going to bake cookies!!! This is my starting picture! 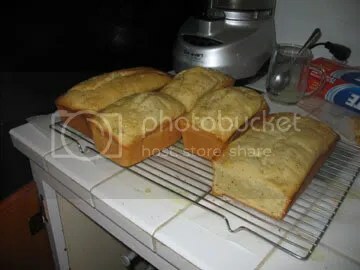 Lemon Poppy Seed Bread…..I have stacks and bags of recipes and I always forget to mark the ones I tried as to which ones I liked and which ones i did not like. I did not like one of the recipes I used, although it had a lighter pound cake like texture, it was moist like it was underdone, when it was not. the other one had less fat in it and we liked it better! F. did a taste test for me! 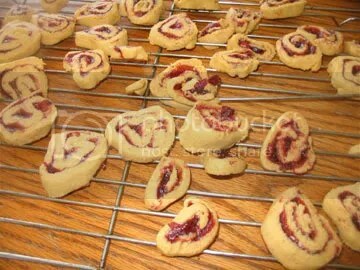 I made three different kinds of cookies, cranberry chip Biscotti, Cranberry orange pinwheels and thumbprint cookies. I am not really good at fancy things so my pinwheels were a little oddly shaped, but some were pretty! After that i had to make dinner, which was broccoli soup. It earned rave reviews from everyone, except the youngest! My 6 year old said I am the best cook ever and had seconds even…..T. had applesauce and bread for dinner……not too protein filled. He asked for cheese on his applesauce so I guess a little! After dinner, P and I hung the load of wash that was still waiting from morning on the line! The boys were all running out of clothes so I have to catch up! <p> Anyhow, it was a productive day and I am glad we got so much done. My wonderful husband helped me by cleaning the kitchen and I showered the youngest boy after he played in the dirt alot today and needed a fresh scent! I am off to bed, but I wanted to post before tomorrow started!! I have been babysitting these last couple weeks in an effort to get some new clothes. Well, finding the time to go shopping and finding something that fits is another matter. Plus if I take children with me, it is pretty much impossible with ladies dressing rooms etc. So, anyhow, I now have a small amount to spend on some clothes, but not the time really to go and plus I was discouraged when I did stop to look at what was available if I will find anything I like and fits. I have a odd size so it is hard for me to find things the right size, length, waist size etc. I have decided that I am going to sew myself some new skirts as that is easy, they turn out fairly well if I take a little time with them and I have the material, I think. But I have to find some nice tops which are not as hard to find, but still I do not like sleeves that barely exist and thin fabric that feels like if one of my sons grabs it in the grocery in an attempt to stay with me, it will tear! I have tried looking online, but it is hard seeing as things are too long, too short, don’t fit the way I want and I waste my money on postage…..
<p> Then of course, I went through the boys clothing and they had enough pretty much. P. could use some new pants as he had only 2-3 pairs and a nice Sunday shirt. I found him a long sleeve cotton one at Walmart for $3, but now his everyday shirts several of them and the other boys got several holes in them….. I was looking online at Children’s Place as they had some shirts, shoes etc for $5, but then I did not know if they needed them that bad and they had some nice polo shirts, but now they do not…so maybe I will go there if they have any left! Tuesday: Black beans and rice and salad <p> I let myself try something new when I was visiting a friend’s house a couple weeks ago. They pick ferns when they are little and clean them, boil them somehow and put some garlic peppery mixture on it when they serve it. They do this and dry it for the rest of the year and I have seen it and was not sure what it was as it looks like seaweed with tendrils that hang down! A little creepy! Well, I really liked it! It tasted like a peppery mushroom! <p> I seem like it is easier to get less food on the same amount of money now. It is hard as it makes it so you have to plan so much, but hey, I am used to it, just not quite all the work it takes to keep up with hungry boys who want to eat three meals and 2 snacks. I think I may make some stuffed eggs for a snack this week, or maybe for our picnic. I love them, but they give me a stomach ache, but sometimes it is worth it! Potato salad might be good too……now I have to get to work, I guess! If I decide not to go to the work of it, then i already have enough easy stuff planned, they should be okay! I was at the doctor’s office and it is always nice to sit down with a magazine for a few minutes. One of the articles was really interesting to me! It was written by a mom of 8 children, who had alot of trouble staying on top of dishes. i could really relate as she recounted how she would clean in the evening and wake up to a counter or sink full of leftover lasagna crusted dishes, peanut butter knives etc. from late night snacking. She discovered a solution for her which I found very interesting. She packed all the dishes away and then went to the store and bought glass soup plates (they can be used as a bowl, but are also large enough for a plate). She bought paint that was able to be used in the dishwasher and painted names on the outside of the each plate and glasses for each person. 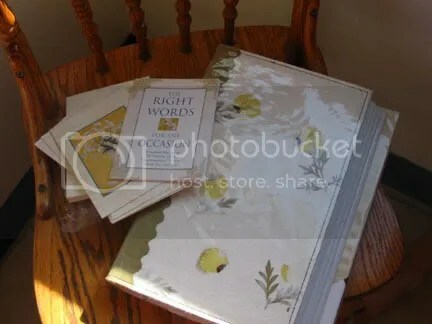 Then she stuck some plates away in case they had guests, but otherwise, they were each responsible after a meal to get their plate cleaned and dried, so they would have it. If not, they did not eat until it was clean. She said, now they were experiencing the joys of scrubbing off dried on oatmeal off bowls and when it was left in the living room, they knew who did it!!! <p> I found it interesting as I did something similar when we moved and put away alot of the dishes. I have still not left too many out and it does really help. I think I need to go and and check again as there have been alot of dishes lately! Jean Mosely was born in the small, lead-mining town of Elvins, Missouri and shortly afterwards the family moved to River Valley Farm in the southeastern range of the Ozarks. Here she lived until she was past 13. "It is the little eeryday joys put together that one big picture of happiness and contentment." says Mrs. Mosley and for her it might be the sounds of a hoot-owl at night or a robin at dawn; the fragrance of the clover-field, woodsmoke, or yeast bread baking; a winter snowfall or just her old black cat asleep on the window ledge. This story has tons of great stories in it that would be fun to read to your family at bedtime or just for family time, as they are really cute, funny and just nice! It was copyright in 1960, but was one of the Christian Herald Family Bookshelf. I have never heard of them, so they must not be around anymore, but great book! <p> Check in the 818.5 (Dewey Decimal system) section of your local library! I have gotten some treasures there!